Buddy, his Beat-up Gibson and the Gods of Guitar. Included in the research project Wise Up, Kid! 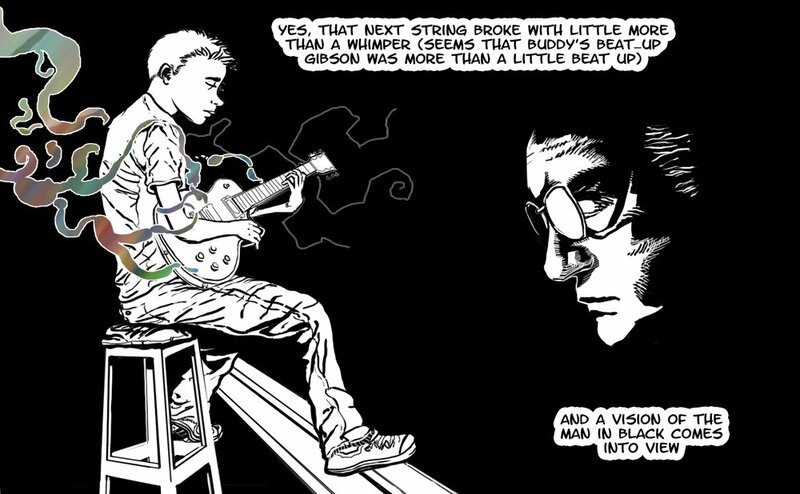 –talkin’ peace, love and straight thinkin’, a comic book application pilot for touch screen tablets, Buddy, his Beat-up Gibson and the Gods of Guitar takes its cues from the Jewish Mussar tradition with a story on gratitude as told by Dr. Alan Morinis. The anecdote concerns the famous violinist Itzhak Perlman and a concert in New York. The objective of this adaptation is to encourage children in an attitude of positivity, flexibility and perseverance - valuable attributes for meeting life’s challenges. Such an attitude might come from a gratitude for what we have rather than what we have not. Aimed at 10 -12 year old children, the comics and activity pages in Wise Up, Kid! address themes of self-worth, compassion, forgiveness, and tolerance. The universal language of comics is utilised to appeal to children; the challenge is to adapt traditional stories for a diverse contemporary audience.